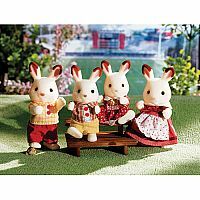 The Calico Critter Hopscotch Rabbit Family enjoys a very active lifestyle. Mother Heidi is a gym teacher at the Cloverleaf Corners high school and Father Harlin is a sports reporter for the local paper. Brother Skip and Sister Bell play high school soccer and pursue outdoor hobbies such as hiking in the summer and skiing in the winter. The delight is in the detail! Calico Critters are itty-bitty 1"-3" flocked animals, fabric dressed and fully pose-able with jointed heads, legs, and arms. Measures approximately: 7.75 x 7.00 x 3.00 inches..